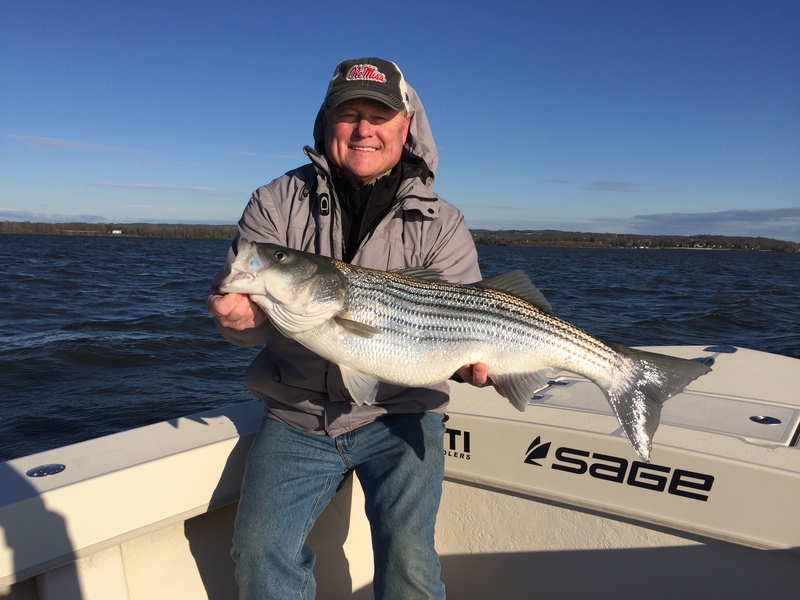 Spring brings catch & release fishing for trophy striped bass on the Susquehanna Flats. This is perhaps the Chesapeake fly anglers best shot at catching a trophy striper in shallow water. While school-sized (20 to 25 inch) rockfish abound, there are enough 10 to 15 pound fish in the mix to keep things interesting. 30 & 40 pound fish are caught every season by novice and expert alike. For spinning enthusiasts, April offers some heart-stopping action casting large surface plugs to these jumbo stripers as they roam the flats. Options are wide open from late spring through the fall season. Tangier Sound heats up in early May with striped bass and speckled trout invading the shallow grass flats and adjacent tidal rivers. This is light tackle fishing at it's finest! A seven to eight wt. fly rod rigged with an intermediate or 24 foot sink tip line is the weapon of choice. Clouser Deep Minnows and Lefty's Deceivers on the working end of the leader will catch most any fish that swims Tangier's waters. Spin fishermen will want a 6 to 7 foot med-light action rod, loaded with 15# braid, and a 3/8 oz lead head rigged with a D.O.A. Lures soft plastic tail. Topwater lures often bring savage strikes during early morning hours and on overcast days. Other species available are bluefish, redfish (red drum), Spanish mackerel, flounder and croaker. A Tangier Grand Slam - catching a striped bass, speckled trout and redfish on the same day - is accomplished by fly and spin anglers with some regularity. Another option during the summer and fall seasons is to join us for a trip on the Choptank River. This is a beautiful portion of the bay and is home to many of the same species as found in Tangier Sound. With the put-off spot located in Cambridge, Maryland, you have the added option of making this a day trip. Cambridge is but a two hour drive from the Baltimore and D.C. metro areas. For those of you who want a relaxing mid-winter experience, try casting to crappie, chain pickerel, yellow perch and largemouth bass on the calm, dark waters of the Pocomoke River. Located near the town of Snow Hill, Maryland the Pocomoke slices through the Great Cypress Swamp, and is one of the deepest rivers for its width in the world. Bald eagles, shorebirds and migrating waterfowl will hold your attention while probing the bald cypress lined banks of this semi-brackish body of water. Capt. Kevin Josenhans holds a USCG Master License and the boat and trip are fully insured. The following is included with the trip: Fishing license and permits - Sage fly rods and reels - G.Loomis spinning rods and Shimano Stradic reels - Lures and custom tied flies - Ice and bottled water. You are more than welcome to bring your favorite rod, tackle and flies. Other items to bring are an extra jacket, hat, lunch, camera, polarized sunglasses, sunscreen and rain gear. Bring a cooler for your vehicle if you intend to keep some of your catch. Every effort will be made to fish if the weather and sea conditions are safe. Should the captain make the determination to cancel due to wind or weather, a full refund will be issued, or the trip may be rescheduled at the client's request.